Rosh Hodesh is the Hebrew term for the beginning of the month on the Jewish calendar which has evolved into a women’s holiday. Temple B’nai Abraham’s Sisterhood—The Women’s Connection joins together, led by Rabbi Faith Joy Dantowitz, a few times a year to welcome the new month with conversation, learning, spiritual growth, and connection. On Rosh Hodesh, Thursday, April 4 , at 7:00 PM, join the TBA Sisterhood—The Women’s Connection, for a Women’s Seder led by Rabbi Dantowitz at the temple. 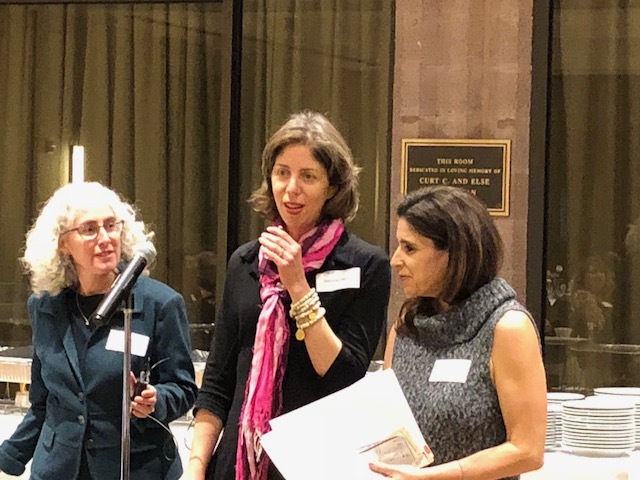 Donna Ellenbogen and Deborah Jacob are Sisterhood Co-Presidents, and Sisterhood member Bernice Garbade serves as Seder chair. Why a Women’s Seder? Passover is the holiday of freedom. A Women’s Seder is an opportunity to celebrate the significant role of women in the Biblical story of the Exodus while also viewing the Haggadah . The evening will be one of spiritual preparation for the Passover holiday and an opportunity as women to relax as free people (without the work of cooking or running the Seder). In preparation for Passover, please bring hametz (a box of pasta, cereal, etc.) to donate to Livingston CHOW. A special evening for women—mothers, grandmothers, aunts, cousins, daughters (post-Bat Mitzvah)— in the community are invited to join us. The cost is $36 per person (includes dinner). Registration is required by March 28 . To register go to tbanj.org/rosh-hodesh-5779 or call 973.994.2290.